Modern Family slideshow with Back to School Tips for Modern Parents! Home ☢ parenting ☢ Modern Family slideshow with Back to School Tips for Modern Parents! 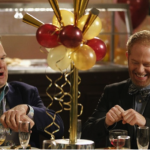 Big changes happen for the Dumpheys and the Pritchetts on Modern Family Season 4. Haley (Sarah Hyland) has a bumpy start at college, and Lily (Aubrey Anderson-Emmons) starts Kindergarten all the while attempting to fend off her helicopter dads Cam (Eric Stonestreet) and Mitchell (Jesse Tyler Ferguson). Phil get “Thorpe-edoed” by arch-rival realtor Gil Thorpe (Rob Riggle), Claire (Julie Bowen) attempts to give her self esteem a makeover by flipping a house, and Gloria (Sofía Vergara) and Jay Pritchett (Ed O’Neill) argue over baby names (Fulgencio? The poor kid!) Modern Family Season 4 released on Blu-ray and DVD on September 24, 2013, and to celebrate, I’m happy to bring you these great back-to-school tips for modern parents. Check out this Modern Family slideshow, and don’t forget that Modern Family Season 5 premieres on FOX on September 25 at 9/8 C. Enjoy! Modern Family slideshow: Back to School Tips for Modern Parents! SHOW YOU CARE: No matter what age your child is, make sure you are sharing in their excitement! Whether you have a kindergartener bringing home a painting or a college student signing up for campus activities, ask them questions about their life and listen to their answers. Celebrate with them when they ace an exam or learn to count to 20. COMMUNICATION IS KEY: Set up specific times to continue growing as a family. There is a fine line between suffocating your college kid and staying informed about what’s going on in their life. Many families will select a certain time, for instance Sunday afternoons, to have family phone calls and catch up on the week’s happenings, even if they have talked throughout the week. Just because your son or daughter has moved out, it does not mean that your relationship has to suffer! In fact, sometimes parent-child relationships grow once the kid has left for college. DISTRACT YOURSELF: Plan a fun activity for yourself right after dropping your son of in his college dorm room or leaving your daughter for the first day of kindergarten. Have a distraction for yourself so that you don’t find yourself at home looking through photo albums and wondering “how did the time go by so quickly?” These steps are exciting, but certainly emotional and you don’t want to wallow in your sorrows. SET GUIDELINES: Before you send off your precious son or daughter to fend for their selves in college, make sure you clearly discuss guidelines. Remind them that even though you are not there to set specific rules, they are still responsible for their actions. Claire and Phil certainly know what it’s like when your daughter calls you one night because they’ve been caught doing illegal things by the police. PREPARE YOUR LITTLE ONE: Kindergarten is a huge step for your little one! Make sure they are prepared for their big day by giving them a basic educational foundation and teaching them to play well with others. When Lily heads off to kindergarten and gets in a tousle on her first day, Cam and Mitchell are put in a very awkward situation. No parent wants to be in the same situation! I absolutely love this show. It’s delightfully dysfunctional and full of imperfect people that make it so ridiculously funny, yet so much more real-life as a sit-com. Cam and Mitchell are my favorites. They are such a real couple, full of insecurities, still learning about each other, total opposites that attracted, but most of all really, truly love each other underneath all the insecurity and drama. I’ve been able to watch it in the past, so I have a lot to catch up on!